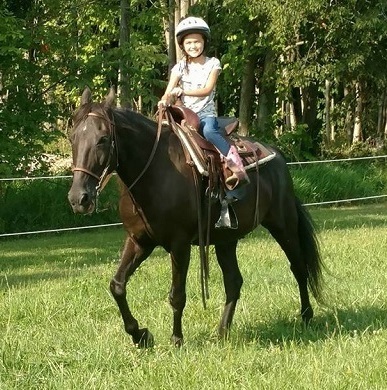 A Tennessee Walker Gelding, Cinder is 21 years old yet full of energy and willingness to please. He is the main horse used for beginners and small children. We trust Cinder completely in just about any situation. He is one of the biggest of the herd and acts as the Great Uncle. He is a leader in the pasture always getting the first pile of hay and standing where he prefers but on the trails his place is usually in the middle or the back.